Hi - part of our job of promoting the love of and use of hand made art beads is to introduce you to some of the best bead shops we know. 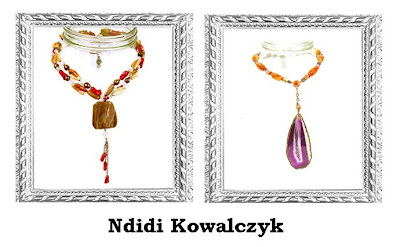 Periodically we'll be posting interviews with the owners of these shops and letting them tell you about how they are supporting and encouraging the creation of jewelry and other crafts using art beads of all kinds. Here is our first interview - hope you enjoy hearing from Cynthia Deis, owner of Ornamentea in Raleigh, North Carolina. 1. What is your business name, website and location? Our store is called Ornamentea, we have an on-line store at ornamentea.com and a ‘real’ store located in Raleigh, North Carolina. We also have a site called beadfreak.com and a second ‘real’ store in Raleigh called Panopolie that sells beads as well as paper arts and felting materials. 2. What kind of handmade art beads does your store sell? What types of materials do your customers prefer? We sell beads by Elaine Ray and Green Girl as well as selected lampwork by local artists. Our customers love Elaine’s beads for their fabulous glaze colors and interesting shapes and the Green Girl beads for their fairy tale sensibility. Our customers prefer beads that are stylish and fashionable and they are not scared of trying something new. 3. How do you stay current with trends in the bead business? What are some of the important things you do for your business? I read magazines, LOTS of them, about fashion and trends of all kinds and also try to pay attention to what our real customers are wearing. Sometimes trends don’t play out in real life and I need to know which ones to pay attention to. 4. What role does education play in your business? Do you offer classes or tutorials? We think that classes are so important and we try to offer new classes throughout the year for beginners and more experienced beaders and jewelry makers. Beading can be intimidating if you don’t know what all those tiny parts can do! We also offer informal instruction at our worktables in the store and often have folks come in for the first time and then leave a few hours later with a fabulous new piece of jewelry. Their faces just glow! 5. In a world of cheap imports and knock offs, handcrafted beads can be a hard sell. 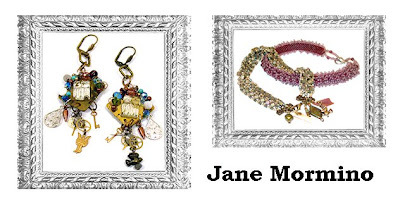 How do you encourage your customers to give art beads a try? Well, I don’t think that handcrafted beads are hard to sell at all! We highlight both of our featured artists in special sections of the store using story boards telling customers about their work. We promote their work by making sure every staff member knows who they are and why their work is special. We also do not sell cheap, knock off beads. We sell beads from China and India, certainly, but we sell those beads they have long produced that are typically considered ‘Chinese.’ We sell blue-and-white porcelain from China, we sell Bali silver from Bali (not cheaper Indian copies), we sell American Art Glass beads made in America, not the cheaper imported mixes. 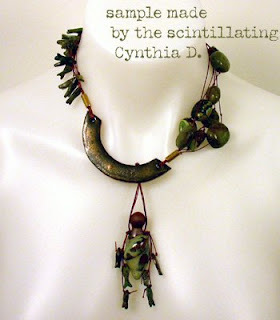 This is a piece of jewelry Cynthia made that features Elaine Ray’s ceramic beads and her momma-and-baby pendant bead. This necklace will be in Stringing magazine this Summer! 6. What kinds of art beads do you look for? Is there a bead you wish an artist would make for your store? When looking at artist made beads I always want that moment when my breath catches and I just have to say “oh, look at this!” I want beads that are appealing with color and shape; work that looks like it can become part of interesting beaded jewelry, as well as standing on its own. I want to see work that tells me the artist has perfected their craft skills and is knowledgeable about the details of their work. Thematic beads are always on my mind. We have customers every day who come in asking if we have a planet bead, a Labrador retriever bead, a leaf bead or a shoe bead. While we carry thousands of charms and beads with (you’d think) almost every possible theme somehow it is not enough. 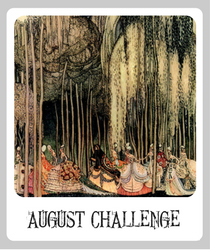 I am always on the lookout for new beads that fill a thematic niche without being cutesy or childish. 7. What beady plans do you have for the future? What bead trends are you excited about? Personally, I am spending the summer working on a book about filigree jewelry. It is due out in January 2008 from Lark Press and I still have a lot of writing to do on it! I hope I have time to make some personal work this summer. One trend we have seen in our stores is that customers who have been basic bead stringers are interested in learning more complex techniques such as silver smithing and creating with metal or polymer clays. We are creating more classes for these folks where they can use a combination of techniques and materials to make their own jewelry components. 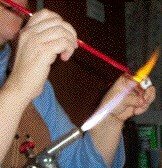 I think this is an important trend for the art bead artist to pay attention to. 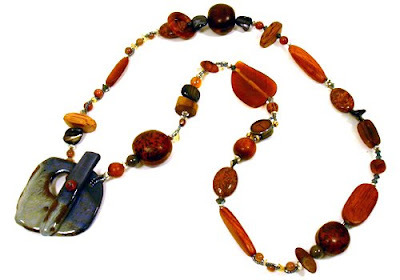 Many of these folks will leave classes where they have made polymer clay beads or their own silver clasps with a much greater appreciation for the work of bead artists and are more avid collectors of art beads. I would encourage bead artists to consider teaching classes at art retreats such as Art and Soul and their local bead stores. Readers can get a free black bead freak tee shirt with any $40 order. These shirts let everyone know you are a beadfreak and are a $25 value. Please mention The Art Bead Scene Blog Tee Shirt Offer in the comments section of your order and we’ll send you a free tee. This offer expires June 30, 2007. Thanks for interviewing me! I had fun and I look forward to seeing more about the Art Bead Scene! Bravo, Cynthia! It fills my heart with gladness when I see a shop owner who says that art beads aren't hard to sell! Bravo! It is so refreshing to find someone looking for the unique and the appreciation for handmade items. I would think that continual change in a store would keep customers coming back to see what is fun and new. Findings worth Finding-Color wonderful Color! Dreams of writing a book? Over 45 good reasons to enter the ABS Challenge!